Last week I featured an audio-docmentary of Fela Kuti by producer Teck Zilla. This week I’ll highlight his first audio-documentary track, The Afro J.E.T.S. Club Project. With J.E.T.S. 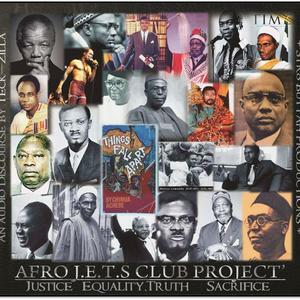 standing for Justice, Equality, Truth, and Sacrifice, Teck features voices who fought for Africa’s liberation. Leaders like Kwame Nkrumah (Ghana’s first president), Nnamdi Azikiwe (Nigeria’s first president) and Patrice Lumumba (Leader of the Congo) make their way on the mix over 70′s Africa beats courtesy of Fela Kuti, Femi Kuti, Ebo Taylor, Gyedu Blay Ambolley, and others. I asked Teck Zilla a few questions about the creation of this project. Why did you decide to focus on 70′s Africa. What some call the golden age of Africa in this period, other classify it is as post-Independence/failed states or “The Lost Decades.” Why this era? From my research the 70s was the height of what I would term the “musical revolution.” The music coming out of that era and I dare say was on par with anything else where. Golden age I agree but failed states? well, I don’t necessarily subscribe to that as most African nations were still coming out of the shadows of their colonial masters and it was a pretty insane era in the political realm. Definitely a story for another day. Why mix music and politics for this project? Good question. Personally I really don’t dabble into politics that much but at the time of making this documentary, I had been consuming tons of material on African history and was completely fascinated about it. Its funny because people might just expect me to know these things but unfortunately I didn’t up my history game until more than a couple of years ago and I’m still awed by my findings. Now the hard part was to blend it with the music, music lovers nowadays generally have a short attention span so I definitely had to cut down a lot of the political aspect like the Mandela/Amical Cabral, Sankara parts. Now that is a whole new timeline I would love to revisit. We thank Teck Zilla for creating an innovative way of blending history, politics, and music in the digital age. Now go ‘head and attend to you history class by giving this mix a listen!